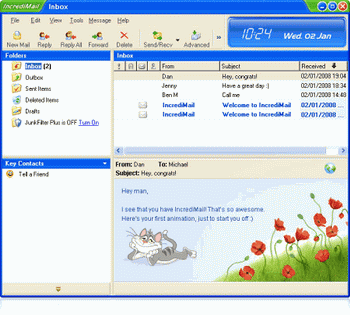 IncrediMail 2 is a powerful, easy to use, feature-rich and fun email program. Better and smarter than ever before, IncrediMail 2 includes features such as a powerful and fast email search tool, taking less than a second for IncrediMail 2 to search through 10,000’s of emails. IncrediMail 2 also features an advanced Address book, enabling you to create contact groups in new convenient ways, see who your most popular contacts are, and assign a picture to each of your contacts. The unique attachments preview options provide a quick glance of the attachment file type you’ve received, may it be a photo, video, Word document, or any other file. IncrediMail 2 introduces a better, more attractive and user-friendly design, making browsing through your emails easier and more productive. IncrediMail 2 also includes a built-in dictionary and translation tool, a personal Display Picture option, and animated effects that are now a part of the user interface. Furthermore, this application comes with a wide range of Stationery, Ecards, Email Backgrounds, Animations and Sounds that you can easily use for enhancing your emails.